The Art card was renamed by Aleister Crowley from its original title of Temperance perhaps because of the original title’s association with groups such as the Women’s Christian Temperance League that pushed through alcohol prohibition in the United States. The card has little to do with that sort of “temperance” but rather the sense in which the word is used in metalsmithing, in which metals are tempered in order to increase their strength and resilience. The title Art refers to the “Royal Art” of magick and the image in Crowley’s tarot is related to the operations of alchemy. 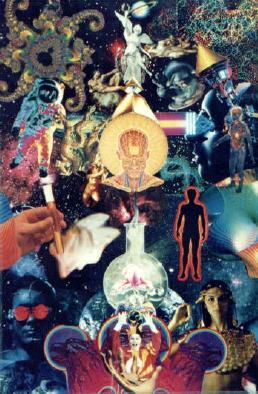 The astral plane is a realm of ideas and chaotic images. It is made up of the contents of consciousness that manifest in a shared, transpersonal manner and can be traversed not only by humans but by spirits as well. Michael and Samantha enter the astral plane in order to consult with Araziel, a spiritual being with whom Michael has worked in the past. Araziel meets the two of them at his palace, an apparently solid structure that is in fact made up of the same substance as the visions and images that the two adepts encounter on their journey there. He explains how to defeat Balzador and helps the two of them enchant a weapon that will accomplish this feat. They return from their journey to find the weapon, a dagger superficially similar to the one Elspeth made in the Magician chapter but differing in its mode of action, charged and ready for use.